Today is May Day. That means that in all sorts of odd corners of the British Isles people will be out enjoying themselves as they celebrate what is probably the oldest annual festival in the calender. 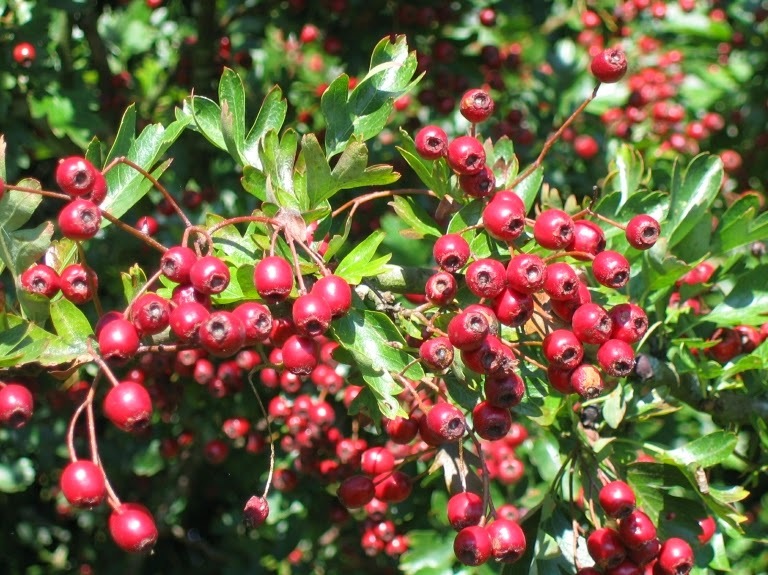 The Hawthorn or May tree - standing here high on Dartmoor and leaning to the east away from the prevailing gales that sweep in from the Atlantic. This was the first day in the farming calender when there was little work to be done (the fields had been cultivated and sown whilst the weeds had yet to become a nuisance), the weather was warm enough to be able to enjoy life again and the main deprivations of winter were in the past. It was a time to celebrate – and to do whatever was deemed wise to ensure that the sown seed produced a fine harvest. Thus the festival took on the air of a fertility rite, one that encompassed not just the good seed sown in the ground but the desire for and abundance of stock and, of course, fine strong and healthy babies. It was at this time that the Romans celebrated Floralia in honour of Flora, the Roman Goddess of flowers and the Germanic nations held Walpurgis Night. It was also about now that the Festival of Beltane when the Druids marked the halfway point between the spring equinox and the summer solstice. Also on Dartmoor but in a far less exposed position and now in full flower. Clearly 2008 was a good year for the May. With the coming of Christianity, May Day became more and more associated with the Virgin Mary and then in July 1889, by authority of the Second International of the Socialists and Communists meeting in Paris, it became the International Workers Day. Even that is not the end of the story: in 1955 Pope Pious XII decided that henceforth May 1 would be a feast day in honour of St Joseph, the patron saint of workers: a carpenter, husband of Mary and surrogate father of Jesus. And this is really what it is all about: the berries that will provide food for birds who will repay the May by spreading the seeds far and wide. ne of the older traditions kept alive here takes place on Magdalan Bridge in Oxford. Each year, just as the sun rises, sixteen of the Magdalan College Choristers sing the Hymnus Eucharisticus (a hymn written by a Fellow of Magdalan College in the seventeenth century). As the last notes of the hymn die away, so the bells of Oxford begin to ring out over the dreaming spires until, after about twenty minutes all fall silent. Not surprisingly, it is an event that attracts a large number of people (it was estimated that over 5,000 crammed the bridge and its environs this morning) and the roads around the bridge have to be closed to traffic. There is also a tradition that youngsters jump off the bridge in to the river – a tradition that is seriously frowned upon as the river here is quite shallow (about two feet deep in usual conditions) and it is quite a jump so quite a lot hurt themselves. No reports of injuries this year, I am happy to say. Nearer home on the north coast of Cornwall at Padstow is the ‘Obby ‘Ors festival. No one really knows the origin of this enormous street party in which two men dressed up a hobby horses dance through the streets, each ‘Ors with its accordian and drum band and singers (known as Mayers) playing and singing the Morning Song. Eventually the two hobby horses meet at the Maypole and then return to their stables as the the crows sing of their death until they are resurrected on the following May Day. Meanwhile countless towns and villages up and down the land will be decorated in the traditional manner with greenery, flowers, bunting and flags while May Poles will be erected and all will be busy with fêtes and fairs. Nearly all of us who live in the country have, at some time or other, been involved in such community activities: even if only in the provision of prizes for the tombola (being, of course, the items won last year and for which there is no real place in any home). Now all we want is for the sun to shine over the week end for while today may be the true May Day we can be sure that the fun and games will carry on until the last possible moment. Not surprisingly I have few suitable pictures in my photo library but if you would like to see some of the garbs that people wear on May Day, just click here.